All jobs have their perks. Football referees, for example, get to travel around the country, stand in front of large crowds, and make incomprehensible hand motions while dressed like a zebra. This would be tremendously exciting if only they didn’t have to constantly blow a whistle, which can lead to deafness, or at least some sort of mouth infection. November 2009: The copy machine only broke once this month. The event is to be celebrated with brightly-colored paper hats. As we’re copying them, the copy machine breaks. June 2010: IT announcement: “Next month, the entire office will be upgraded to Microsoft Excel 2007." March 2012: The entire office is upgraded to Microsoft Excel 2007. Of course, we had the occasional perk, like the time I got to spend a few days testing out a BMW 1-Series M for “competitive analysis.” (In other words: I promised my boss I’d stop taking two-hour lunches.) And while Jalopnik already had a few things to say about it, I’ve decided to provide my take as well. Because let’s be honest: you can never get too much 1-Series M. Especially if you’re a BMW dealer. We start this review with a disclaimer: I am not a BMW fanboy. I know what you’re thinking: Of course you are! You’re writing about cars on the Internet! You must be a BMW fanboy! And I admit, this is generally true. Most car writers love BMW - a fact they demonstrate with sentences like: The 2004 6-Series is eye candy from all angles. These words actually appeared in the January 2004 issue of Motor Trend, presumably following a conference call with BMW’s PR department. With that settled, on to the 1-Series M. Let’s start with styling: the 1-Series looks like a shoe. This is an indisputable fact, sort of like how all of Audi’s sedans look like all of Audi’s other sedans, or how all of Honda’s sedans look like all of Honda’s sedans from three years ago. It can be said, then, that - thanks to a bodykit, big wheels, and a wider track - the 1-Series M looks more like one of those brightly-colored running shoes that are popular with the kind of people who jog in place when they’re waiting to cross the street. Inside, the 1-Series M loses its shoeish qualities and instead takes on the persona of an automobile. A very fuzzy automobile. That’s because every surface inside a 1-Series M is covered in Alcantara, which is a wonderful, soft material that remains both wonderful and soft for approximately seven weeks, unless you touch it, in which case it’s more like seven hours. Still, Alcantara seating is a welcome departure from most BMWs, which boast “leatherette” upholstery even if you spend $74,000 and order every single option. The reason none of this matters is because you’re not thinking about shoes or Alcantara when you’re driving a 1-Series M. Instead, you’re thinking: This is the best thing in the history of time. Or possibly: This car is so good that maybe the 2004 6-Series actually was eye candy from every angle! In other words: the 1-Series M turns you insane. The 1-Series M is also exactly the right length, unlike its larger M brethren, which currently range in size from “Giant Redwood” to “Upcoming Dubai Skyscraper.” And there’s just enough engine power to make you smile, but not so much that they’ll still be finding pieces of you months after the accident. In other words, the 1-Series M really is that good. It handles like a mid-engine car despite being front-engined, and it gives you a strong sense of ownership pride despite being orange. But for all its good traits, the 1-Series M has one seriously bad one: the price. Two years later, it’s still trading over sticker, with the average seller asking more than $63,000 on AutoTrader.com. 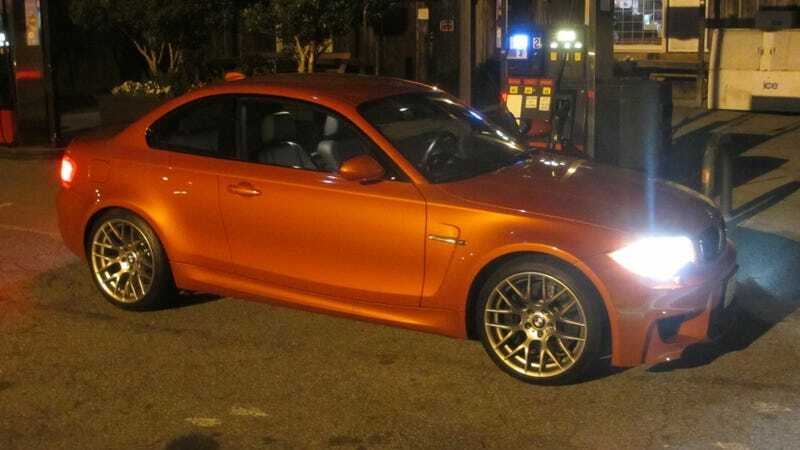 That means it’s better to find a friend with a 1-Series M and ask if you can borrow it. Or, you can just go work for Porsche. I hear they’re thinking of upgrading to Excel 2010. Doug DeMuro operates PlaysWithCars.com and writes for The Truth About Cars. He owned an E63 AMG wagon and once used a pontoon boat to evade police at the Tail of the Dragon. (It didn't work.) He worked as a manager for Porsche Cars North America before quitting to become a writer, largely because it meant he no longer had to wear pants. Also, he wrote this entire bio himself in the third person.